GeoPopularity is an algorithm developed by AVUXI as part of the TopPlace™ product. It is the underlying component of many of the calls available within the API. 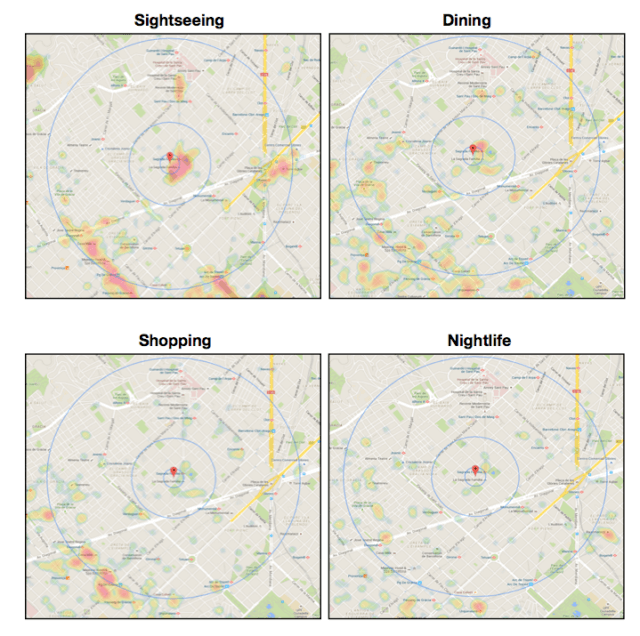 Depending on how GeoPopularity values are interpreted in relation to spatial information, different insights can be discovered about certain places. 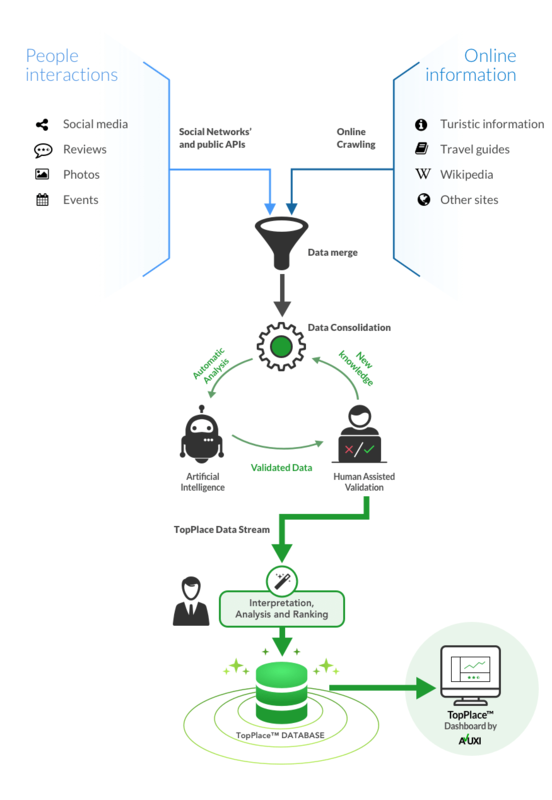 The Geopoularity algorithm collates feedback information about a certain place from many different online media sources into a human understandable number to measure the popularity of that place. It is important to understand that this algorithm will not indicate the most travelled or elitist places, but rather, indicate places that have left a very positive impression on people. For each place, the GeoPopularity algorithm generates a general Venue Score between 0 and 100, and a similar score for certain categories of social relevance. 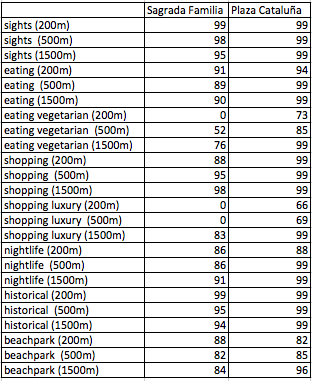 For example, we can find popular places to visit, but not to eat, hence the importance of theses other scores. The main objective of the GeoPopularity, is to provide a method of scoring the venues of any city by social category, for example nightlife, shopping, etc. Discover relevant venues in different data sources. Match venues from different sources into one data packet. Normalise the data with the data packet to know what categories to assign to the venue and what is its exact location. Extract the popularity data for each venue: total check-ins, total reviews, ranking, etc. Calculate scores and normalise them in relation to the city in values from 0 to 100: this gives us the Venue Score, which can now be saved on our database as a Point Of Interest. With the previous steps our system created unique Points Of Interest (POIs) that are the base for all the processes within the TopPlace™ Rest API. The Venue Score for each POI is used in the response for the majority of the requests to the TopPlace™ Rest API. Now we can look at the components for each request. 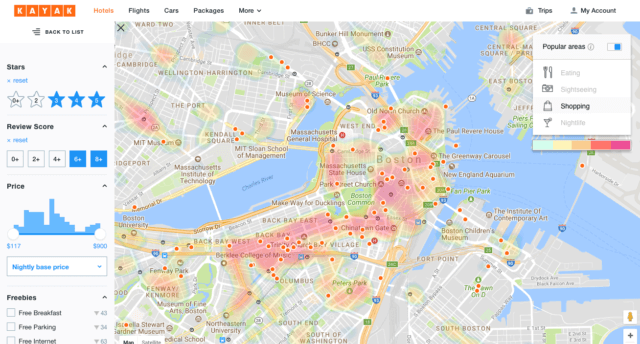 Heat Maps show the most relevant areas based on Venue Score concentration. Darker areas on the map indicate places with greater concentrations of venues with high Venue Score for the chosen category. Heat Maps can be create with tiles and vectors. This API only offers the vector version. From a visual point of view, Heat Maps are easy to understand, yet the data they provide is not of great depth. In contrast, the Location Score gives us the popularity information at any point in a city based on the Venue Scores of nearby places. A Location Score is calculated for distances of 200m, 500, and 1500m. This gives users an idea of how relevant a place is if they are willing to walk 5, 10 or 15 minutes, respectively. For each distance a Location Score is given out of 100 for each category. The aim of Location Score is to give an indication of how well located a place is in relevance to its immediate surroundings. The Location Score can also be used to generate textual information about any point. This is the basis of Location Score Elements (discussed later). The following images show Location Scores by category within the 3 radial distances of 200m, 500m, and 1500m from a location. 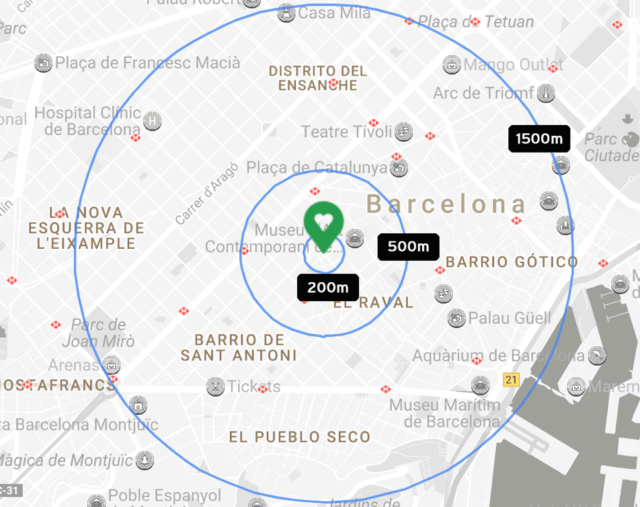 Below is an example of Location Scores calculated for a hotel near the Sagrada Familia and Plaza Cataluña. 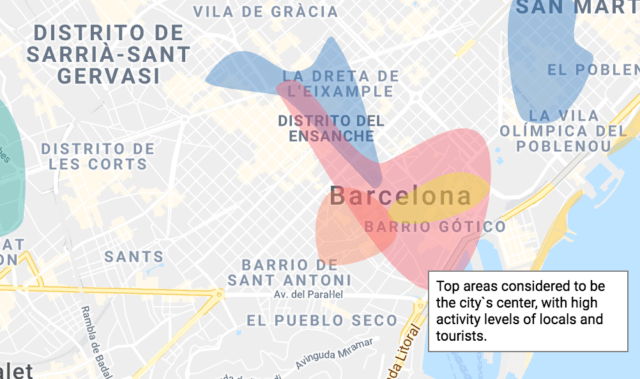 One can easily see that for short walks from the hotel, luxury shopping appears to have a low score near to Sagrada Familia and very high in Plaza Cataluña area. Areas of Interest are generated using criteria other than the aforementioned. The objective is to visualise cities in ways that people can immediately understand, see the below map for an example. Areas of Interest can show which areas of a city are business areas, the city center, student zones, the beach, etc. Whilst Location Score is used to discover popular places, the main objective of Areas of Interest is to describe a city with a common framework that can be applied to all the cities in the world. Thereby giving first time visitors to a city a quick overview of the rough layout of a city.